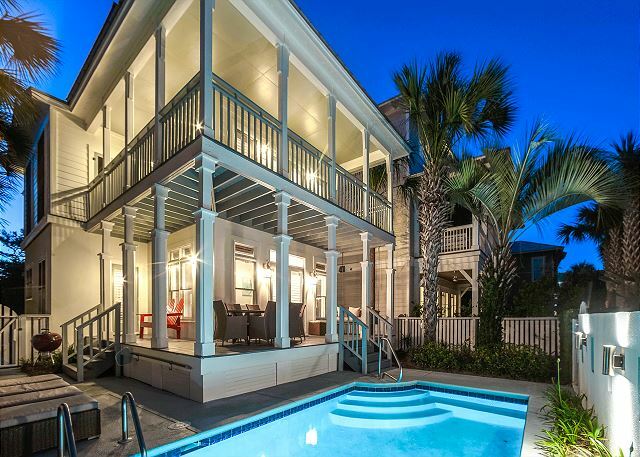 This gorgeous three story home in Panama City Beach is elegant and can comfortably house twelve people. The location is only a few steps from the beach and close to the numerous boutiques and unique dining experiences in Aly’s Beach and Rosemary Beach. Time will fly as you explore 30A or spend your time frolicking on the beach. You can even enjoy swimming in your very own private heated pool. The photographs of this property show the amount of care the owners have given to turn this wonderful place into an incredible memory of you and your family having fun on the beach. The outside is a true masterpiece of comfort including a private pool surrounded by loungers cushioned for comfort. A large outdoor table and gas grill complete the beautiful outdoors. When you walk inside these rentals you will see an enormous living room including enough seating for nine people to enjoy the 50 inch flat screen television. The dining table is big and comfortably seats six while the lovely granite kitchen island seats an additional four. This kitchen is extremely well equipped and roomy. You can prepare delicious seaside delicacies and even use the crock pot so something delicious is waiting for you after your day has ended. The first floor has a large bedroom and two double beds. A private bath adds to the charm and the stone waterfall effect in the shower is unique and breathtaking. The second floor features two bedrooms. The main bedroom has a king size bed and a 43 inch flat screen television. The private balcony is peaceful with extremely comfortable seating. The bath has a luxurious tub and a tile shower enclosed in glass. The second master bedroom has a queen sized bed, access to the deck on the second floor and a big flat screen television. This bath has a beautiful tile shower enclosed in glass. The barn door in the hallway hides a full sized washer and dryer for your convenience and keeps everything fresh and clean. The third floor has a loft bedroom made for kids. Four children can sleep on two double beds that fold out and enjoy the flat screen television. There is even storage underneath the bed for clothing. The loft opens to a deck with comfortably cushioned seating for at least six people. When the evening breezes turn slightly cool the fire pit adds a delightful warmth. Wave N’ Sea is the perfect vacation on the beach for one or two families. The location is divine, the space perfect and the beach filled with sensational blue waters and golden sand. There is no place better to relax, enjoy and have the time of your life.